Printing History: Printing during the 16th and 17th centuries underwent rapid transitions in technology and popularity. This page contains the entire printing history of the “The Passionate Shepherd to His Love” (including the broadside ballad). Please note: for concise presentation, only first editions of the text are listed. A version of “The Passionate Shepherd to His Love” and the “The Nymphs Reply to the Shepherd,” attributed to Sir Walter Raleigh, was written verbatim by John Thornborough, William Herbert Earl Lord Pembroke’s Chaplain. This version is transcribed in John Henry Ingram’s Christopher Marlowe and His Associates, 1904.2 The earliest dated entry in John Thornborough’s (Dean of York and Bishop of Limerick) Commonplace Book is 1570. As there is no way of knowing when this version was written, or even in which general period it might have been written, this version is not included in the timeline below. Click on the links to view the texts! 1599 printed without a title in the The Passionate Pilgrim, anthology of 20 poems (by by W. Shakespeare) collected and published by William Jaggard, without the author’s name. 1619-29 printed as a broadside ballad with the title “A most excellent Ditty of the Louers promises to his beloved” (see About the Broadside), without author’s name. 1653 printed under the title of “The Milkmaid’s Song” in Izaak Walton’s Walton’s Complete Angler. Both the original poem and reply are printed together: authors listed as Christopher Marlowe and attributed to Sir Walter Raleigh. 1875 printed under the title of “The Passionate Shepherd to His Love” in the Golden Treasury of English Songs and Lyrics by Francis Palsgrave, author listed as C. Marlowe. 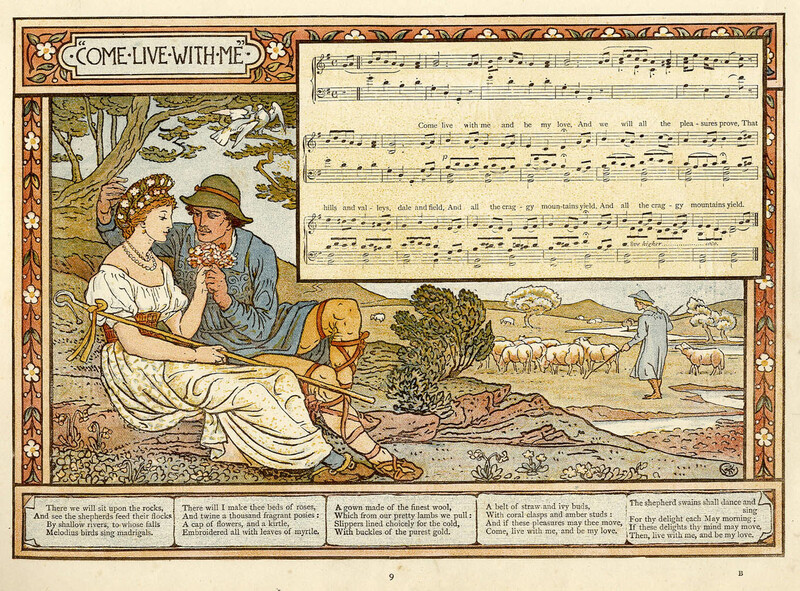 1883 printed under title the of “The Passionate Shepherd,” with an illustration by Walter Crane and a composition by Theo Marshals, in Pan-Pipes: A Book of Old Songs Newly Arranged & with Accompaniments, without the author’s name. 1891 printed under the title of “The Passionate Shepherd to His Love” in The Blue Poetry Book by Andrew Lang, author listed as Christopher Marlowe. 1902 printed on handmade paper bound in vellum by Robert Howard Russell, under the titles “The Passionate Shepherd to His Love” and “The Nymphs Reply to The Shepherd” in The passionate shepherd to his love, by Christopher Marlowe, and The nymph’s reply to the shepherd, by Sir Walter Raleigh.4 The decorations and lettering for this edition were done by Mr. P. A. Schwarzenbach. Authors listed as Christopher Marlowe and Sir Walter Raleigh. The textual history of Christopher Marlowe’s “The Passionate Shepherd to His Love” is one that brings with it as much confusion as it does intrigue. I have used two different online programs to create two kinds of timelines. The first timeline contains links and videos; it is designed to be presented to a class or group. The second is more interactive and features quizzes, videos, audio, and visuals. The images are linked. 1 “Armenian printing blocks – 17th century.” The British Library. 2 Ingram, John Henry. Christopher Marlowe and His Associates, 1904, pp. 222-226. 3 In the notes of John Flasket’s England’s Helicon, “Bullen states that this poem was originally signed S.W.R. in the extant copies and that a slip Ignoto was substituted” (Flasket, 245). 4 Marlowe, Christopher. The Passionate Shepherd to His Love. R. H. Russell, 1902.